When it comes to protecting your motorcycle, getting bike theft insurance may be quite valuable if it should get stolen. But how important is it to have motorcycle theft insurance, especially considering the additional cost? Why is Bike Theft Insurance Important? Over the past decade, the number of bike thefts has actually dropped from around 62,000 in 2007 to roughly 45,000 in 2013. Although the drop has been dramatic, it also shows signs of leveling off at a high level which mean that your bike is still in danger of being stolen. Motorcycles are still one of the favorite items for thieves to steal primarily because they can be moved easily into a truck or other form of transportation in a manner of seconds. This means that even in broad daylight a bike can be stolen often with no witnesses to the crime. Add to this the fact that many Americans still do not take the proper precautions in protecting their bikes and it is little wonder that so many thieves prefer to take a motorcycle. Over the past several years, Honda, Yamaha and Suzuki motorcycles have been the most popular models for thieves to steal with Kawasaki and Harley-Davidson not too far behind. Sport and city bikes are common targets more than off-road motorcycles arguably because of their accessibility to being stolen. Summer is the most popular season for motorcycle thefts mostly because more people get out and ride their bikes during that time of the year. However, your motorcycle is vulnerable the year-round if it is not properly secured. Standard motorcycle policies may or may not have theft protection, so you will have to check them to see if that aspect is actually covered. While many comprehensive insurance plans offer that type of coverage, it will need to be specifically stated in the policy itself. Otherwise, many motorcycle owners opt to get separate motorbike theft insurance for their coverage. Having affordable bike theft insurance can be an excellent back-up just in case your bike is taken from you. Which Type of Coverage is Suitable? When considering motorcycle theft and insurance, you will want to search for the plan that best suits your needs while fitting into your budget. Many comprehensive coverage policies will include theft insurance as a rider which adds to the total cost of the policy. However, you can purchase separate theft insurance for your bike if you do not need comprehensive insurance. If you do not own your bike outright and are paying a loan, then comprehensive insurance with theft protection will most likely be a requirement. However, if you own your bike outright you’ll have to make the decision about how much coverage you want to place on it. Generally speaking, newer bikes from the manufacturers that are most likely to be stolen should warrant theft protection. Be sure to use renter’s insurance bike theft protection as well in case you are renting a bike. If your bike is older and not very valuable, then you probably have less to fear from it being stolen. However, this does not mean that you should forgo having theft insurance. Actually, you should be able to find very low cost policies that cover the total value of your motorcycle that make it the perfect addition to your state mandatory insurance coverage. If you do need to make a bike theft insurance claim because your motorcycle was stolen, then the first step is to report your bike being stolen to the authorities. Once that is completed, then you should a record of your insurance and call the claims office. Your insurance policy will have the basic information needed so that your claim can be properly filed. After taking down the information about your policy, the claims agent will then ask you about the circumstances of how your bike was stolen. You will need to answer the questions truthfully and honestly to the best of your knowledge so that the agent can take down the information as accurately as possible. What you tell the agent should match what you told the authorities about your motorcycle. The insurance company will note any important discrepancies they find, so be consistent. You will want to check back on your claim to make sure that they are taking the appropriate action. After all, you have been paying motorcycle theft insurance premiums just in case of this event. If your bike is recovered, then the claim can be stopped. Otherwise, you should collect it after the pre-designated time has passed. The impact on your motorcycle theft insurance cost will depend on the circumstances that your bike was stolen and the value of the bike itself. Even if you took all the proper precautions, you will see a rise in your insurance costs. If the bike was stolen because you didn’t take the proper precautions, you may expect to see an even higher rise in your motorcycle theft premium. Rises of 10% or more are rather uncommon, but they can happen if this is not the first time your bike was stolen. However, most cost increases are less than that if they happened for the first time and you took the proper precautions. There are a number of ways that you can protect your bike from being stolen. 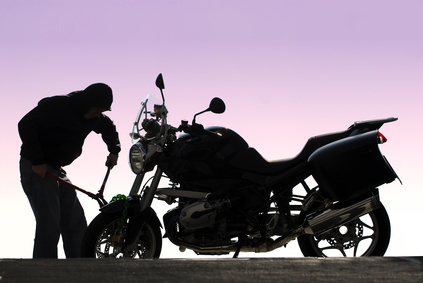 Here are just a few tips on motorcycle theft prevention that will help dissuade the thieves. Keep your bike inside the garage when not in use. Lock your bike to the nearest secured post when traveling. Install anti-theft devices that sound off if the bike is being moved. Park in a very well lit area. These are just a few ways that you can keep your bike safe. However, the best preventative method is your vigilance in making sure that your motorcycle is secure at all times. By taking a bit of extra precautions, you can greatly reduce the chances that your bike will be stolen. More tips to prevent motorcycle theft. One way to help lower your bike theft insurance premiums is by installing security devices that disable your bike. From ignition switches to using locks and chains, the better you can secure your bike, the less likely it will be stolen. Thieves like easy targets, so any motorcycle with a security device acts to dissuade them from taking it.